Are you looking for some easy ways to make your wedding ceremony and reception a little more personal and unique? 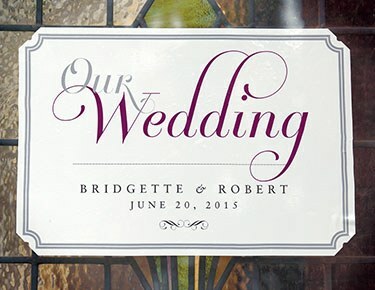 Our selection of wedding signs can be customized to add that personal touch to every aspect of your wedding day. Our huge selection of designs makes it easy to find something that's a wonderful fit for your wedding style. Whether you're planning a fancy, formal affair or a laid-back backyard wedding, we have some stylish wedding signs to spruce up your décor. From modern customized wedding signs with a minimalist feel to mini chalkboards for weddings with a more rustic vibe, you'll find exactly what you're looking for here! Not sure where to add signs to your wedding? We're here to help you plan it all out. First, put up a sign or two directing guests to the ceremony and reception. Our directional wedding signs can be hung from trees, placed on a table or adhered to a stake to welcome guests and help them find their way. By placing a personalized wedding sign at the entrance to your event, you'll set the tone for a wonderful day that guests will be excited to experience. 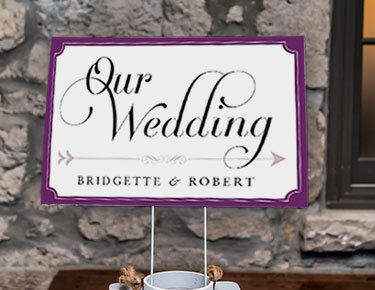 We have a great assortment of welcome wedding signs for sale at The Knot Shop, featuring unique designs that set the stage for your whole affair no matter the theme! Now it's time to think about your reception decor. Where could some signs create a lovely backdrop or photo opportunity? 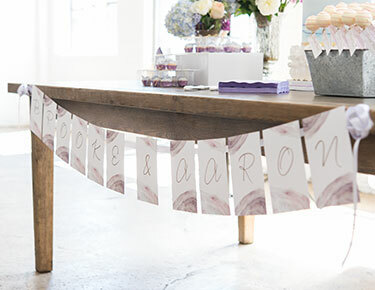 Consider adding bunting with you and your new spouse's names to the head table. 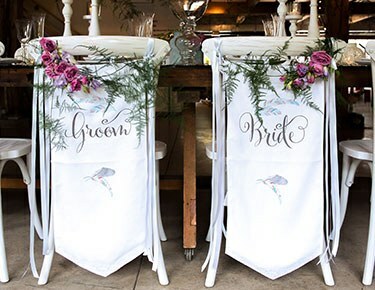 Our wedding chair signs also look adorable when placed on the back of the married couple's chairs. 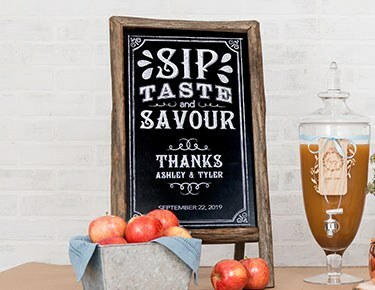 Chalkboard wedding table signs can be customized with menu items or a reception timeline, or you can use mini chalkboards as seating assignments. 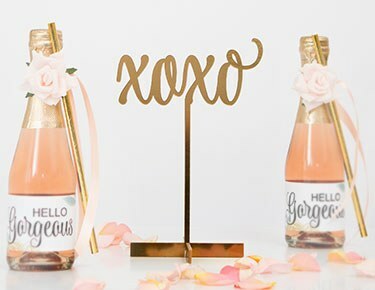 Add acrylic signs to your centerpieces, and choose a canvas or paper backdrop for your photo booth station. As you can see, the options really are endless when it comes to using wedding signs for your event. 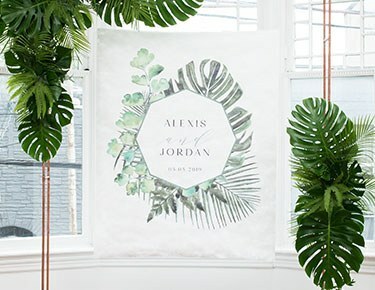 Browse our full collection of pre-printed and customizable wedding signs at The Knot Shop to find the right accents for this special occasion. With free shipping on orders of $99 or more and superior customer service, The Knot Shop is the best place to shop for everything related to your ceremony and reception!